Workers Fighting To Organize the South! 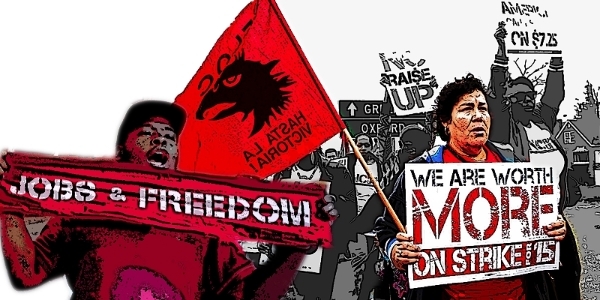 On Saturday, August 9 workers from across NC and other Southern states will gather in Goldsboro, NC for Solidarity City – a day long gathering of workers to discuss strategy, develop their organizing skills, and lay out how to continue to build a united effort to organize the South. Summer 2014 will be a time of looking back to the history of the South for inspiration and guidance for the contemporary Southern freedom movement. It is in this spirit that Moral Freedom Summer has taken root. In this spirit, we will convene low wage workers in August 2014 for education, culture building and strategizing. We believe that such a gathering will be a powerful experience for workers, labor activists, the Forward Together movement and the broad public. Solidarity City will carry on the spirit of the Forward Together Moral movement with a specific focus on the issue of living wages and labor rights, focusing on the goal of $15 and the freedom to form a union for all workers. The conference will be targeted at workers from North Carolina and workers from other Southern states but will also include clergy, community activists and organizers. Worker participants can be union members or be unorganized. We hope you can join us as we make the call to create a new Poor People’s Movement to change the South and change the nation and demand a future for working people.